Information Portal pam65.ru hour special for lovers of fashion meter time is an exclusive watch company Moog, which is widely presented their products at the annual exhibition – fair BaselWorld 2012. 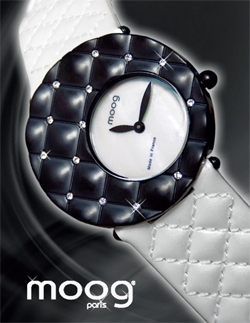 French watch company Moog is a manufacturer of women’s watches. The company’s products Moog presented four exquisite lines of watches: Time to change, Metal Chic, Fashionista, Collection 2010. A very remarkable feature of the Moog became interchangeable watch straps. The patented quick “change” straps, ladies can easily “agree” with the color of watches handbags, shoes or clothing. Included for each model is from 1 to 8 removable straps made in different colors. Straps can be easily replaced by rotating parts at the two ends of buildings. So what does the company Moog introduced the BaselWorld 2012? According to the presenter, watches Moog – it is not just measuring time, and the life style of fashionable girls and women. Any girl can pick up a Moog watches her outfit and a special case. Moog company is more than 150 versions of the straps, made of different materials and in different color variations. The company also represents Moog various dials, made in bright colors. At the BaselWorld 2012 the company also introduced the Moog four new collections. The first model presented embossed steel watches, the frontal part of which is decorated with crystals Swarovski. The model is presented in different color variations, as they say, for every taste and color. The next collection was provided by a collection of Facet. Facet – a special form of cutting, in which case presented in this collection. Sides of the watch masters of this collection of decorated crystals Swarovski. Facet model collection are also available in different color variations. The next collection was presented Huit. Name of the collection is translated from French means “eight”. In the hours Huit emphasis placed on the face of a figure 8, which is made in a different color from the rest of the indices and size. The final collection is a collection of Night and Day. Opening Night and Day from the company Moog designed for women who love to travel. Watches are equipped with a display second time zone. The dial is decorated with crystals Swarovski. If you are interested in, and demonstrated the model you decide to buy a watch Moog, Moog is retail price ranges from 100 euros to 200 euros.